This is probably the shortest description of a train journey I have ever written. 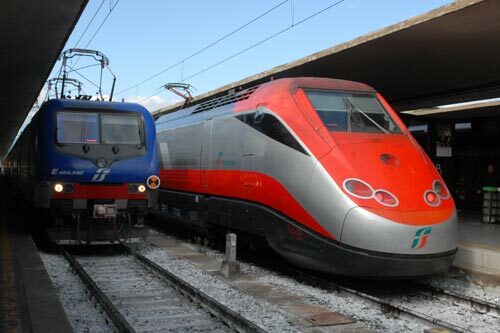 Joining the high speed train at the main station in Firenze I was anticipating a pleasant journey through the Tuscan countryside. After negotiating my way through the hordes of tourists milling about the station I fought my way to the platform and waited for the train's arrival from Rome. The "Frecciarossa" high speed train set arrived on time and I located my first class seat. As soon as I sat down a smiling hostess offered a drink and snack, which in hindsight was probably designed to take your mind off the tedious journey that was about to start. Departing on time we gathered speed through the suburbs of Firenze and dived into a tunnel. A few brief glimpses of daylight and plenty of dark tunnel later we arrived at rage subterranean platforms at Bologna. The journey was fast but utterly depressing with 35 minutes of darkness. Looking ahead it is likely that the planned HS2 high speed route from London to Birmingham in the UK might be just as boring ... However the tunnelling will be needed to satisfy local residents rather than to bore beneath the Apennine Mountains!